Although James Joyce began these stories of Dublin life in 1904, when he was 22, and had completed them by the end of 1907, they remained unpublished until 1914 -- victims of Edwardian squeamishness. Their vivid, tightly focused observations of the life of Dublin's poorer classes, their unconventional themes, coarse language, and mention of actual people and places made publishers of the day reluctant to undertake sponsorship. Today, however, the stories are admired for their intense and masterly dissection of "dear dirty Dublin," and for the economy and grace with which Joyce invested this youthful fiction. From "The Sisters," the first story, illuminating a young boy's initial encounter with death, through the final piece, "The Dead," considered a masterpiece of the form, these tales represent, as Joyce himself explained, a chapter in the moral history of Ireland that would give the Irish "one good look at themselves." But in the end the stories are not just about the Irish; they represent moments of revelation common to all people. Now readers can enjoy all 15 stories in this inexpensive collection, which also functions as an excellent, accessible introduction to the work of one of the 20th century's most influential writers. 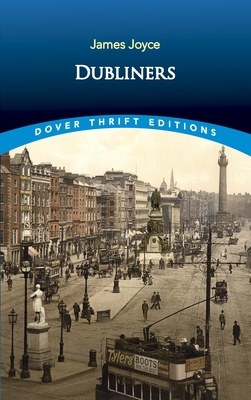 Dubliners is reprinted here, complete and unabridged, from a standard edition. Sooner or later, most undergraduates encounter him, and some scholars devote their careers to his exuberantly eloquent prose. James Joyce (1882-1941) led the vanguard of 20th-century fiction, and his experimental use of language and stream-of-consciousness technique continue to captivate, intrigue, and influence modern readers and writers.